This tree in Colorado Prefers a deep, moist, and well-drained soil. Unlike most evergreens, this spruce does well in alkaline soil as well as acidic. Grows well in full sun to partial shade on sites protected from winter wind. If grown in too much shade the tree becomes thin and leggy and will not thrive. Growth habit Serbian Spruce offers thin arching branches that turn up slightly on the tips, with a slender straight trunk. Grows 50 – 60 feet tall with a 25 foot spread. 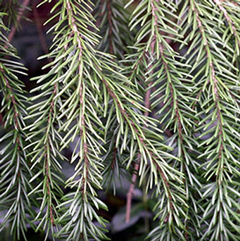 Foliage Serbian is one of the few spruces with flat needles, not the four-sided needles of most spruces. The short, ½ inch to 1 inch long needles are lustrous dark green above while the underside has two broad, white stomatal bands. These bands collectively standout, creating a unique silvery contrast that is very effective when the upswept branches move in the wind. Fruit Cones are egg-shaped to 2½ inches long and pendulous, blue-black when young, cinnamon when mature. 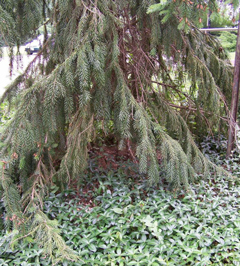 Insects and diseases Few diseases appear to bother Serbian spruce, some sources list aphids, mites, scale and budworm as potential insect problems. The notable exception is White Pine Weevil. This pest will destroy the central leader and can seriously disfigure Serbian spruce if not controlled. Landscape value Successful planting of the Serbian spruce is best accomplished in early spring. Early fall is also acceptable, but consistent weekly watering is required to prevent the needles from drying out. A good soaking before the ground freezes in late fall is recommended. 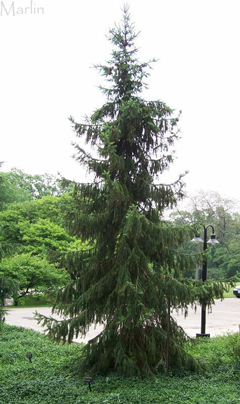 Maintenance for the Serbian spruce is minimal. Fertilization is not required and prune only to remove dead or broken branches. 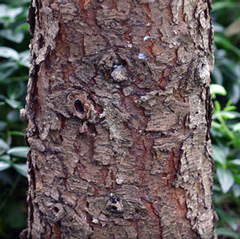 Interesting features It can be used in groups, as a single specimen, or even as an evergreen street tree. It has utility as a natural screen and selections with a narrow habit are suitable for even small urban landscapes. 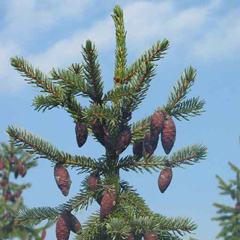 Serbian spruce represents a welcome alternative to the all-to-common Norway and Colorado spruce.